The Stovall Mill Covered Bridge stretches a short span across the swiftly moving Chickamauga Creek beneath it. Built in 1895 by Will Pardue, it was built to replace a similar structure that was destroyed in the early 1800’s and was named after the nearby mill. It has been known over the year by other names, including the Sautee-Nacoochee Bridge, Chickamauga Bridge and the Helen Bridge. 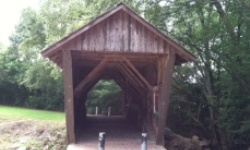 While it does have the distinction as being the smallest covered bridge remaining in Georgia, the wooden structure is still strong and sturdy. In its early days the Stovall Mill Covered Bridge was used by the inhabitants of the rural mountain communities of Northeast Georgia to get to the towns of Cleveland or Helen, or for town-folk to travel up into the Blue Ridge Mountains of North Carolina. However, the main reason the bridge was constructed was to haul raw timber and grains to the grist, saw and shingle mills that were scattered in the valleys and along the rivers of northern White County. In 1951, the bridge was featured in the movie, “I’d Climb the Highest Mountain.” Today the Stovall and the relaxing sounds of the Chickamauga provide a setting for picnics, stream fishing, photos, and just quiet reflection. Passersby will find plenty of parking and a historical marker with more information about the Stovall Mill Covered Bridge and its significance in the community over the years. This is a great stop for history buffs and those who love to pack a picnic lunch with great choices from nearby restaurants and local food markets. From the Author: The Stovall Mill Covered Bridge is just two miles north of the Village of Sautee on Hwy 255. There are parking areas on both sides of Chickamauga Creek with easy access to the highway. The bridge is in good structural shape, considering its age, however it has been the victim of needless graffiti over the years. While it is not shiny and polished, the Stovall Mill Covered Bridge played a critical transportation role for the people of the rural Appalachian communities of the early 1900s. It remains an historically significant reminder that the timber industry that thrived here for generations fueled much of the progress that brought our country into the modern era. There are picnic tables on the grassy lawns on the edge of the creek, some of them shaded by the surrounding trees, if you would like to enjoy the sound of the water and look out at the bridge while you enjoy a picnic.